Weed is a term for any plant growing in a setting where it is not wanted, such as undesirable plants in a garden, lawn, or agricultural field. The term often is used to describe native or nonnative plants that grow and reproduce aggressively (Janick 1979). Weeds may be unwanted because they are unsightly, or they limit the growth of other plants by blocking light or using up nutrients from the soil. They also can harbor and spread plant pathogens that can infect and degrade the quality of crop or horticultural plants. Weeds may be a nuisance because they have thorns or prickles, cause skin irritation when contacted, or parts of the plants might come off and attach to fur or clothes. Weeds in pastures may be ones that are poisonous or inedible to the livestock. The term weed in its general sense is a subjective one, without any classification value, since a weed is not a weed when growing where it belongs or is wanted. For example, dandelions are sometimes viewed as plants with beautiful flowers and desirable culinary and medicinal values; gardeners and homeowners may see dandelions as difficult-to-eliminate nuisances to well-manicured lawns. [[ Ralph Waldo Emerson]] stated: "What is a weed? A plant whose virtues have not yet been discovered." This reflects the principle of dual purposes, whereby every plant not only advances its own individual purpose of survival, growth, and multiplication, but also serves a purpose for the whole (ecosystem, humans). Plants that are undesirable in one environment may be important as the base of food chains, or provide aesthetic, culinary, and medicinal values. A weed in an agricultural plot may be integral to a forest ecosystem and an invasive species in one country may be valuable in its native country. Sometimes the value of a plant just needs to be discovered or developed through human creativity. For example, the wild carrot, Daucus carota, or Queen Anne's lace, is listed as a noxious weed by the U.S. Department of Agriculture. On the other hand, the carrot that is a popular agricultural crop, Daucus carota subsp. sativus, is simply the domesticated form of the wild carrot. It has been bred for its greatly enlarged and more palatable taproot, but is still the same species. Weeds are those plants that are undesirable in their particular environment. Although most commonly used for unwanted plants in a garden, lawn, pasture, or agricultural field, the term also is extended to include unattractive or troublesome plants growing in parks, woods, lakes, and other natural areas. For example, grasses growing in an agricultural plot with maize or tomatoes will compete with the crops for sunlight, nutrients, and water. Ragweed growing in a field or vacant lot next to a residential area may cause problems with allergies from the pollen. Vegetation may clog a private pond, bamboos may spread outside of the intended area, or dandelions may multiply across a manicured lawn. The term weed is not a biological term, since it is an arbitrary term. One person's weed may be another person's flower or source of food or medicine. Indeed, a number of "weeds" have been used in gardens or other cultivated-plant settings. An example is the corncockle, Agrostemma, which was a common field weed exported from Europe along with wheat, but now sometimes grown as a garden plant. Plants commonly considered weeds generally share similar adaptations that give them advantages and allow them to proliferate in disturbed environments whose soil or natural vegetative cover has been damaged. Naturally occurring disturbed environments include dunes and other windswept areas with shifting soils, alluvial flood plains, river banks and deltas, and areas that are often burned. Since human agricultural practices often mimic these natural environments where weedy species have evolved, weeds have adapted to grow and proliferate in human-disturbed areas such as agricultural fields, lawns, roadsides, and construction sites. The weedy nature of these species often gives them an advantage over more desirable crop species because they often grow quickly and reproduce quickly, have seeds that persist in the soil seed bank for many years, or have short lifespans with multiple generations in the same growing season. Perennial weeds often have underground stems that spread out under the soil surface or, like ground ivy (Glechoma hederacea), have creeping stems that root and spread out over the ground. A number of weedy species have developed allelopathy—chemical means to prevent the germination or growth of neighboring plants. "To thy fair flower add the rank smell of weeds: But why thy odour matcheth not thy show, The soil is this, that thou dost common grow." (William Shakespeare, Those parts of thee that the world's eye doth view). Not all weeds have the same ability to damage crops and horticultural plants. Some have been classified as noxious weeds because if left unchecked, they often dominate the environment where crop plants are to be grown. They are often foreign species mistakenly or accidentally imported into a region where there are few natural controls to limit their spread and population. With the conversion of land to agriculture producing areas of open soil and with the human distribution of food crops mixed with seeds of weeds from other parts of the world, many weeds have ideal areas for growth and reproduction. 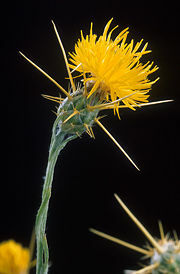 A number of plants labeled by some as weeds, such as the dandelion Taraxacum, are edible, and their leaves and roots may be used for food or herbal medicine. Dandelions, while being considered by some a lawn weed, are one of several species that break up hardpan in overly cultivated fields, helping crops grow deeper root systems. Burdock is common weed over much of the world, and yet is sometimes used to make soup and other medicine in East Asia. Some modern species of domesticated flower actually originated as weeds in cultivated fields and have been bred by people into garden plants for their flowers or foliage. Some so-called "weeds" may have other beneficial effects, such as drawing away the attacks of crop-destroying insects. On the other hand, some plants may be breeding grounds for insects and pathogens that attack other plants. Håkansson, S. 2003. Weeds and Weed Management on Arable Land: An Ecological Approach. Wallingford, UK: CABI Pub. ISBN 0851996515. Janick, J. 1979. Horticultural Science. San Francisco: W.H. Freeman. ISBN 0716710315. Reed, C. F., and United States Agricultural Research Service. 1971. Common Weeds of the United States. New York: Dover Publications. ISBN 0486205045. Weed Identification Guide from Virginia Tech (Southeastern United States). This page was last modified on 9 August 2013, at 23:30.